Heat oven to 350°F. Spray cookie sheet with Crisco® Original No-Stick Cooking Spray, or line with cooking parchment paper. Spread coconut in shallow pan large enough to hold French loaf; set aside. In small bowl, beat egg and milk with wire whisk or fork until blended; pour into another shallow pan large enough to hold French loaf. Roll loaf of dough in egg mixture until thoroughly coated, then roll in coconut; press coconut into loaf. Place loaf on cookie sheet. Bake 26 to 30 minutes or until golden brown. Remove from cookie sheet to cooling rack. Cool completely, about 30 minutes. In small bowl, mix marmalade and gingerroot; stir in pear. Set aside. Set oven control to broil. On cutting board, cut loaf with serrated knife into about 22 (1/2-inch) diagonal slices. Place slices, cut sides up, on cookie sheet. Broil with tops 6 inches from heat 45 to 60 seconds on each side or until light golden brown, being careful not to let coconut burn. Spread 1 rounded teaspoon cream cheese on each slice. Spread 1 rounded teaspoon marmalade mixture on cream cheese. 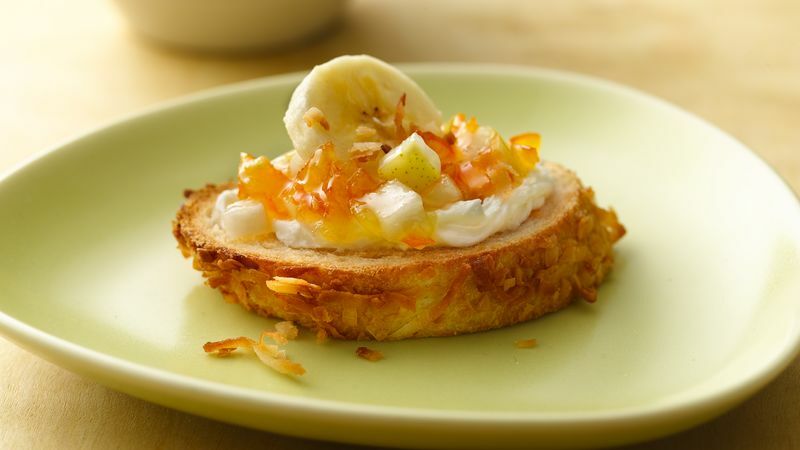 Garnish with banana slice and any coconut remaining on cookie sheet.